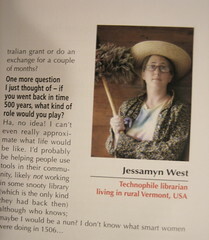 In case you missed this on Flickr… I was interviewed by Geraldine Barkworth for a column called Librarians on the Edge in the November 2006 issue of inCite, the Australian version of American Libraries. I said she could look around Flickr and find a picture of me that she liked and she chose this one, much to my amusement. Tags: alia incite jessamyn me! ← where does the money go, NYPL? Why are you carrying Oscar the Grouch’s head on a stick? Seems rather barbaric to me.